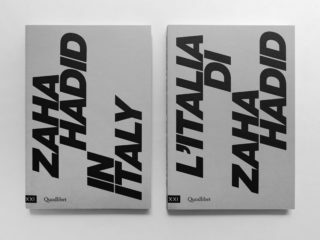 Zaha Hadid in Italy is an exhibition celebrating the late architect’s practice, from her major architectural works through to small-scale design projects. 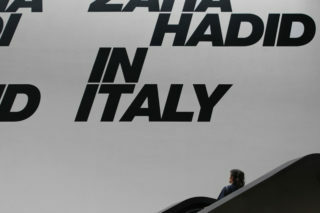 The exhibition was designed by Zaha Hadid Architects and hosted by MAXXI in Rome. 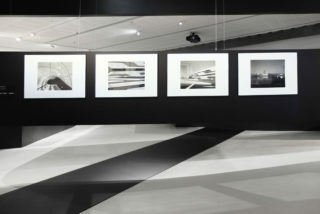 The exhibition’s “container” — i.e. 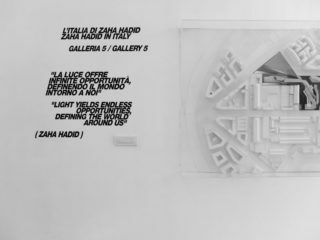 the MAXXI museum, and more specifically Gallery 5 — were designed by Hadid herself some years earlier. 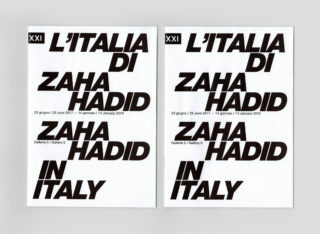 Hadid’s project for the MAXXI was perhaps her most significant in terms of establishing the credibility of the studio internationally. 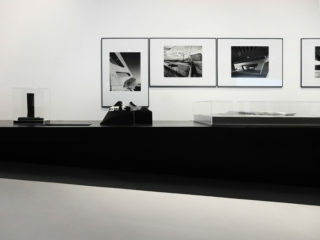 Consequently, in proposing a design solution for this exhibition we felt a responsibility to develop a project that was appropriate not only to the content of the exhibition but also to the building that would house it. 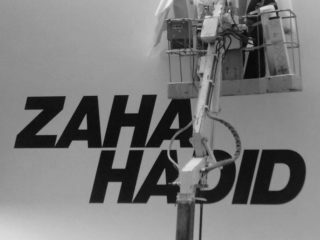 Effectively we were dealing with a kind of Russian doll: work by Zaha Hadid, in an exhibition designed by Zaha Hadid Architects, and hosted by a venue that was also one of Zaha Hadid’s projects. 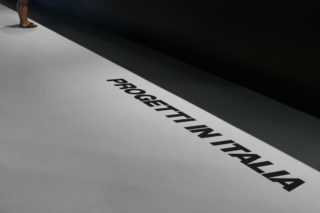 Therefore in developing the exhibition’s visual identity we opted to take the building itself as point of departure. 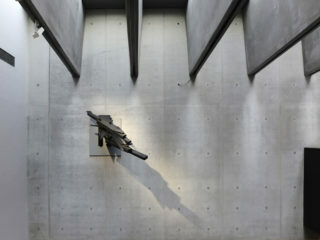 In particular the distinctive sloping window of Gallery 5. 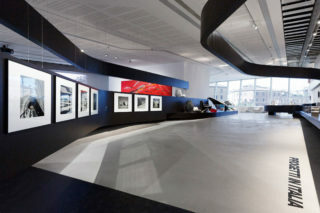 The museum’s design follows the flow of the urban context in which it is located, weaving space in the form of interlacing galleries. We developed the exhibition’s logo by taking inspiration from the point where the building’s “warp and weft” meet: a typographic representation of the intersection between Gallery 2 and Gallery 5. 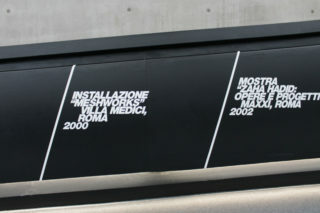 The dominant presence of the black typography echoes the museum’s imposing, voluminous spaces. 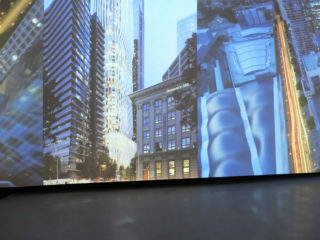 Similarly, the slanted font employed across the entire project is intended to recall the unique sloping design of the large window that looks out onto the museum’s main plaza from Gallery 5, venue for the exhibition. 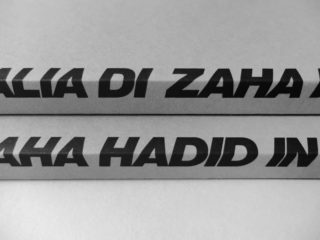 In order to avoid clashing with either the content or design of the exhibition, we chose to develop and display the timeline of Hadid’s works exterior to the main exhibition areas. 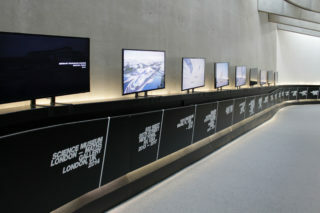 Located immediately outside Gallery 5, this serves as an introduction for visitors as they approach the exhibition entrance. 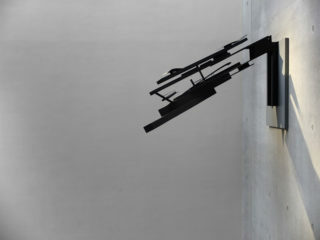 Exhibition curated by Margherita Guccione, Woody Yao. 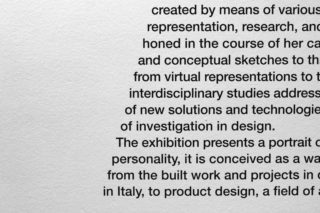 Design section curated by Domitilla Dardi.